Music Titan Ahmet Eretegun. Photo courtesy of Reuters. 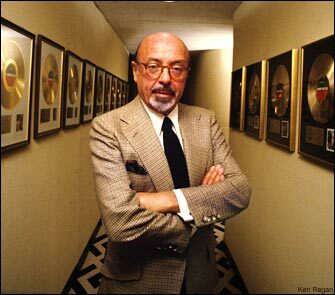 Ertegun with platinum and gold records that created the signature of American music. Photo: courtesy of newscore. Ahmet Ertegun and Ray Charles photos courtesy of Reuters. We were proud to staff the Ertegun home in New York when called upon to help round out their staff. Mr. Ertegun and his lovely wife Mica, a renowned interior designer, ran one of the finest homes on the East Coast. Ertegun was known as the father of music recording. A music industry titan who was a founder of both Atlantic Records and the Rock and Roll Hall of Fame, he passed away leaving an incredible musical heritage known throughout the world. 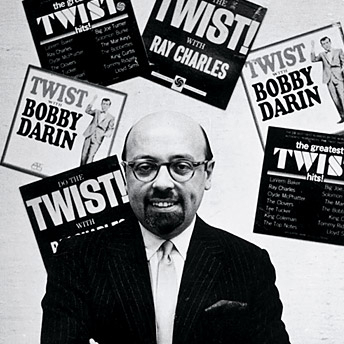 Ertegun helped usher in the transition from rhythm and blues to rock & roll, signing Ray Charles and the Drifters to Atlantic and producing Big Joe Turner's original version of "Shake, Rattle and Roll." Ertegun's forged relationships with a wide range of talent, from John Coltrane, Ornette Coleman, Charles Mingus to Led Zeppelin, Crosby, Stills and Nash and AC/DC, and Sonny and Cher. Mr. Ertegun loved a broad range of music. A Turkish émigré who moved to the U.S. as a young boy, Ahmet Ertegun's career is an American dream come true. Ertegun signed Ray Charles, Joe Turner and Ruth Brown. Atlantic became known for developing the Southern soul sound with Stax Records and the arrival of Aretha Franklin, Otis Redding, Wilson Pickett and Solomon Burke. Mr. Ertegun also signed Cream and Led Zeppelin, and convinced Crosby, Stills and Nash to take Neil Young on tour with them, much to the benefit of rock & roll. 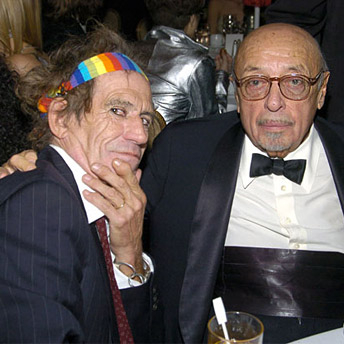 His reputation as a man of refinement and known with his wife Mica as a highly cultivated couple, made him a negotiating force: When the Rolling Stones were looking for a label partner for their imprint, it was well known that Ertegun's jet-setting style sealed the deal with Mick Jagger. Ertegun joined forces with Rolling Stone founder Jann Wenner and Sire Records head Seymour Stein to create the Rock and Roll Hall of Fame Foundation. He received the Grammy Trustees Award and named a "Living Legend" by the Library of Congress. Ertegun had an emeritus role as Founding Chairman of Atlantic, overseeing the label as it continued to rack up commercial successes with multi-platinum releases from Jewel, Stone Temple Pilots and Matchbox Twenty, and an increasingly eclectic roster that included Björk, Kid Rock and Death Cab for Cutie. His eclectic range of music cemented Atlantic's unwavering relevance in the music industry. Ahmet Ertegun was a unique visionary whose influence and inspiration remains indelible.